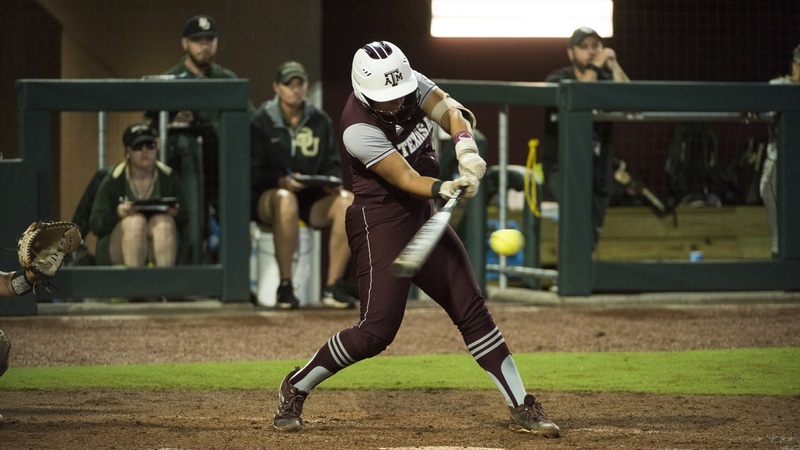 The Aggie softball team’s season came to a heartbreaking close after losing 5-3 to Florida in walk-off fashion in Game 3 of the Gainesville Regional, seeing Florida advance to the College World Series. With two outs in the bottom of the seventh, Florida’s freshman Jordan Matthews launched a three-run homer for a walk-off win. The Gators would be the first to score in the bottom of the fourth after the first few innings saw no action on the scoreboard. After two singles and a runner reaching on a fielder’s choice, Hannah Adams dropped an RBI single into left field to put Florida on the board. Florida would tack on another run in the fifth inning. Janell Wheaton would capitalize by driving in her teammate with an RBI single into left field. A&M would answer back in the top of the sixth. Tori Vidales and Kelbi Fortenberry hit back-to-back singles and then Ashley Walters worked a walk to load the bases. The Aggies would scratch across a run on a wild pitch with Vidales crossing the plate after Riley Sartain struck out on a pitch in the dirt. The Aggies would put Florida on the ropes in the top of the seventh thanks to none other than Tori Vidales. Down to their final out, Vidales launched a two-run shot over the center field wall, putting them ahead by a run. Jo Evans stuck with Trinity Harrington (13-7, 2.22 ERA) as she started her third-straight game, allowing five hits and just one run before being replaced by Payton McBride. McBride took over in the fifth inning and navigated through two innings and gave up just a run. Harrington was called on in the final inning and couldn’t finish off the game, as she put two away before allowing the walk-off home run. When it was all said and done, Harrington had given up four runs in 4.2 innings of work. Florida heads to Oklahoma City for the Women's College World Series and will square off against the Georgia Bulldogs. Was such a crushing defeat to watch. My daughter played with three current players on the A&M roster so we watch every game that we can. I was so heartbroken to see how that game ended. What a range of emotions. We were one strike away from going to CWS and then one pitch later, the season was over! Nice season ladies. Good luck to the 6 seniors. In the postgame press conference the Florida coach said that he and his staff were determined to not pitch to Tori in that situation or put Barnhill in to face her. They did neither, but instead it's left to Jo Evans to explain how she managed her pitchers. I was thinking when Tori came to bat they would pitch around her like Mississippi State did in the SEC tournament and take their chances with Kelbi. The team really came together and battled in the post season. Would have liked to see how they would have done at the CWS.